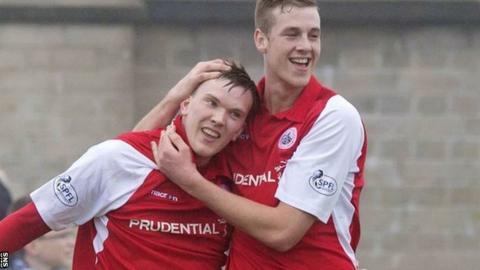 Stirling Albion kept alive their hopes of securing a spot in the promotion play-offs with a convincing win to spoil Peterhead's title party. Craig Comrie put the visitors ahead after 35 minutes, meeting David McClune's cross with a precise header. David Weatherston moments later latched on to Phillip Johnston's long ball and slotted beyond Graeme Smith. Graham Weir added a third soon after the break with a superb effort before Comrie's low finish. Stirling remain fourth and now only need a point at home to third-top Clyde, who are two points ahead, next week to book their place in the play-offs. Berwick are three points behind and host Peterhead, who were presented with the League Two trophy after the match against the Binos. Match ends, Peterhead 0, Stirling Albion 4. Second Half ends, Peterhead 0, Stirling Albion 4. Attempt saved. Scott Ross (Peterhead) header from the right side of the six yard box is saved in the bottom right corner. Corner, Peterhead. Conceded by Jamie Bishop. Andy Rodgers (Peterhead) is shown the yellow card. Graham Weir (Stirling Albion) is shown the yellow card. Graeme Sharp (Peterhead) is shown the yellow card. Foul by Graeme Sharp (Peterhead). Graham Weir (Stirling Albion) wins a free kick on the left wing. Foul by Dean Cowie (Peterhead). Philip Johnston (Stirling Albion) wins a free kick in the defensive half. Bryan Gilfillan (Peterhead) wins a free kick on the right wing. Corner, Peterhead. Conceded by Lee Hamilton. Substitution, Stirling Albion. Dale Fulton replaces Craig Comrie. Foul by Andy Rodgers (Peterhead). Philip Johnston (Stirling Albion) wins a free kick on the left wing. Goal! Peterhead 0, Stirling Albion 4. Craig Comrie (Stirling Albion) right footed shot from the right side of the box to the centre of the goal. Assisted by Jordan White. Substitution, Stirling Albion. Mark Ferry replaces Darren Smith. Attempt missed. Bryan Gilfillan (Peterhead) header from the centre of the box is close, but misses to the right. Corner, Peterhead. Conceded by Jordan White. David Cox (Peterhead) wins a free kick on the left wing. Attempt saved. Jordan White (Stirling Albion) left footed shot from outside the box is saved in the bottom right corner. Foul by Bryan Gilfillan (Peterhead). Chris Smith (Stirling Albion) wins a free kick in the defensive half. Foul by Fraser McLaren (Peterhead). Ross Forsyth (Stirling Albion) wins a free kick in the defensive half. Substitution, Peterhead. Bryan Gilfillan replaces Jordon Brown. Graeme Sharp (Peterhead) wins a free kick in the attacking half. Foul by Jordon Brown (Peterhead). Darren Smith (Stirling Albion) wins a free kick in the defensive half. Corner, Stirling Albion. Conceded by Dean Cowie. Attempt blocked. Jordan White (Stirling Albion) right footed shot from outside the box is blocked. Substitution, Stirling Albion. Jamie Bishop replaces David Weatherston. Scott Ross (Peterhead) is shown the yellow card. Foul by Scott Ross (Peterhead).